Timothy James Rozon (born June 4, 1976) is a Canadian actor born in Montreal. 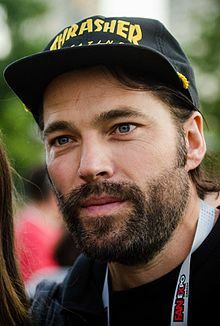 Rozon is known for portraying the characters of Tommy Quincy on the CTV teen drama Instant Star, Mutt Schitt in the CBC comedy Schitt's Creek, and Doc Holliday on the Syfy/Space drama series Wynonna Earp. Rozon's first role of note was supporting Mira Sorvino in the 2000 A&E film The Great Gatsby. His big break came in 2004 when he landed the role of Tom "Tommy Q" Quincy in the CTV/TeenNick teen drama Instant Star, a role he portrayed for four seasons. In 2018, he and the cast of Wynonna Earp received the People's Choice Award for best Sci-Fi show. The show won as a write in candidate due to the show's fandom known as "Earpers". Rozon resides in Montreal where he co-owns the restaurant Garde Manger with Canadian celebrity chef Chuck Hughes. He has been married since 2015. Rozon with Instant Star co-stars. Naked Josh Charles Episode: "Game, Set-up, Match"
15/Love Jimmy Kane Episode: "Seedy Reputation"
Fries With That John Smith Episodes: "Undercover Guy"
The Listener Peter Garvin Episode: "My Sister's Keeper"
2010 Rookie Blue Gabe Lessing Episode: "Takedown"
2011 Flashpoint Alex Carson Episode: "I'd Do Anything"
Against The Wall Shane Episode: "A Good Cop"
18 to Life Male Model Episode: "15 Minutes of Shame"
19-2 Richard 2 episodes: "Winter" & "Medals"
2017 Saving Hope Spencer Walsh Episode: "Birthday Blues"
Wikimedia Commons has media related to Tim Rozon. This page was last edited on 3 April 2019, at 19:05 (UTC).